In a similar fashion to the Ultra Monster Personification Eleking-San statue released a few years ago, Griffon Enterprises is apparently carrying on that concept with their Ultra Kaiji Gijinka line of PVC statues. 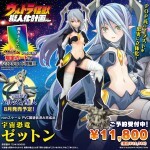 The first two to receive the bishojou anime girl treatment will be the Kaijus Zetton and Baltan, both will retail for 11,800 yen before shipping fees. Zetton Girl will be released in September while Baltan Girl comes out in August, and both can now be pre ordered from AmiAmi as of this writing.